You've taken your car through the car wash, and you've vacuumed out the inside, but there's still something you're missing. The most important part of your car, the engine. Hidden under the hood, you never notice how dirty it gets. Road grime and oily buildup splash up on the engine, coating it black with filth. But you can blast it all away with a pressure washer. Protect all electrical components with saran wrap to prevent water from getting in and causing issues. Focus on protecting alarm systems, electrical connections, wiring of the battery, spark plugs, and the distributor cap. Use a degreaser detergent. Make sure the engine's not hot, otherwise the detergent can't soak properly and you could burn yourself while cleaning. Spray the engine thoroughly, coating all corners. Use a firm brush to work the degreaser in. Leave the degreasing detergent settle on the engine so it can effectively loosen the grease. Once the detergent has settled, you're ready to rinse. 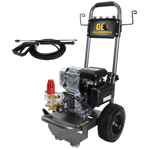 Using a pressure washer, lower the pressure a bit to avoid blasting water into the electrical components. If you can't adjust the pressure, be sure to hold the wand further from the engine. 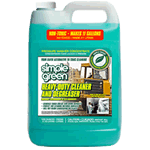 Spray away all of the cleaner and residue until the engine is as clean as possible. It's most effective to use microfiber towels, but you can use old rags if you wish. Wipe everything as dry as you can. Areas you can't reach can be left to air dry. You may still find some dirty spots. You can use the towel on these and scrub those areas clean with a little "elbow grease." Spray down non-metal areas with plastic/vinyl care spray. A popular brand to use is Armour All. Leave it settle for a couple of minutes, then wipe off excess. Using a microfiber towel or other soft cloth, buff the protectant to a nice shine. This will not only protect your plastic and vinyl coverings from drying out and cracking, it will also make it look quite nice. Now that you're finished cleaning, drying, and buffing, you will want to make sure you remove the plastic saran wrap or plastic wrap you used to protect your electrical components. If you forget, the heat from your engine will melt it on, which is definitely something you don't want to have happen. Keeping Your Motor Clean.. Our Power Equipment Direct how-to library can help you learn about Proposition 65 Product Labeling, Sales Tax Information and Product Recalls for Pressure Washer Equipment.